A review of the "flu season" in Australia indicates it is suffering through one of its worst in recent years, according to a Today report." Health officials reported more than 168,000 influenza cases so far in 2017, compared to just under 91,000 in 2016 and 100,000 in 2015. The reason for a severe flu season in the Southern Hemisphere may be two-fold: 1) There is an increase in the number of patients being tested as rapid testing has become convenient and provides an immediate conclusion, thereby separating the true flu cases from other viruses, and 2) The predominant flu strain — H2N3 — is known to be severe. Experts say what is happening in Australia may foretell what is likely to happen in the United States. "There is every reason to expect that we could have a severe flu season this year," said Dr. Robert Atmar, an infectious diseases expert at Baylor, in the report. "It's always hard to predict what is going to happen, but people should be prepared." Unfortunately, one of the flu's primary characteristics is its unpredictability in terms of ability to mutate and render the flu shot less effective than initially expected. However, that should never deter people from being vaccinated as research has shown that some protection is better than none. Officials are urging everyone, including the most vulnerable (e.g., babies, elderly), to obtain a flu shot as there are additional protective advantages regardless of how effective it is this upcoming season. The vaccine is readily available and suggested for people six months of age and older. The Flumist nasal spray vaccine is no longer available for children due to its ineffectiveness in the past. Several types of intramuscular vaccines are available this year, including the trivalent (3-strains), quadrivalent (4 strains) and the high-dose trivalent (for people over the age of 65 who may not mount the best response with a lower dose vaccine). 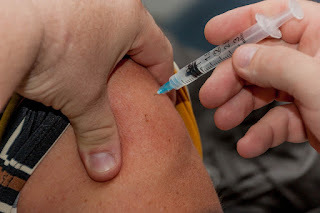 The Centers for Disease Control and Prevention recommends that healthcare consumers speak with their healthcare provider about the most appropriate shot and should not wait until well into the season to receive the vaccine as it takes a few weeks for the development of antibodies.